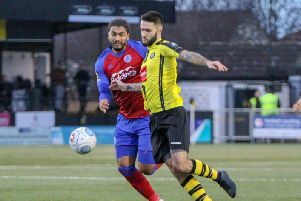 Harrogate Town's five-match unbeaten run came to an end following a flat performance on the road at Barnet. Simon Weaver's team never really got going in North London, failing to seriously test home custodian Mark Cousins until the fourth minute of stoppage-time. The Bees began the brighter of the two sides and remained in the ascendancy for much of the opening period. While Town struggled to make any real impression as an attacking force, their hosts played some good football, with lively right-winger Ephron Mason-Clark posing plenty of questions. Dave Tarpey curled a free-kick just over the top of James Belshaw's goal, before actually forcing the Harrogate stopper into action with a powerful header from Mason-Clark's right-wing corner. Town defended their box well enough, with Callum Howe impressive, however they found themselves a goal down after half an hour. Shaquile Coulthirst released Mason-Clark down the right and he cut the ball back for Tarpey to blast a first-time effort past Belshaw from the edge of the area. It took until the dying embers of the first half for Town to muster any kind of a response, Mark Beck glancing a header wide of the mark before Kelvin Langmead met Josh Falkingham's deep right-wing cross at the back post, but nodded straight at Cousins. The second 45 began with Weaver's men showing far more urgency, though Barnet's first foray forward of note ended with Wesley Fonguck cutting in off the left and unleashing a goalbound effort that was deflected just past the post by the shin of Howe. And it could easily have been 2-0 just after the hour-mark when Cheye Alexander's centre from the right found Coulthirst unmarked, but with just Belshaw to beat he got his header all wrong and missed the target. 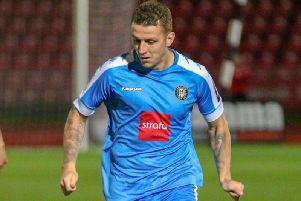 At the other end, the returning Joe Leesley saw a couple of stinging efforts blocked in quick succession shortly after arriving from the substitutes' bench. Barnet did have to survive a 94th-minute scramble inside their six-yard box following Leesley's corner from the left that saw Cousins produce a good parry to thwart Beck, however the final whistle followed almost immediately. Defeat means that Town miss the chance to climb as high as fourth in the National League standings and remain in sixth position.